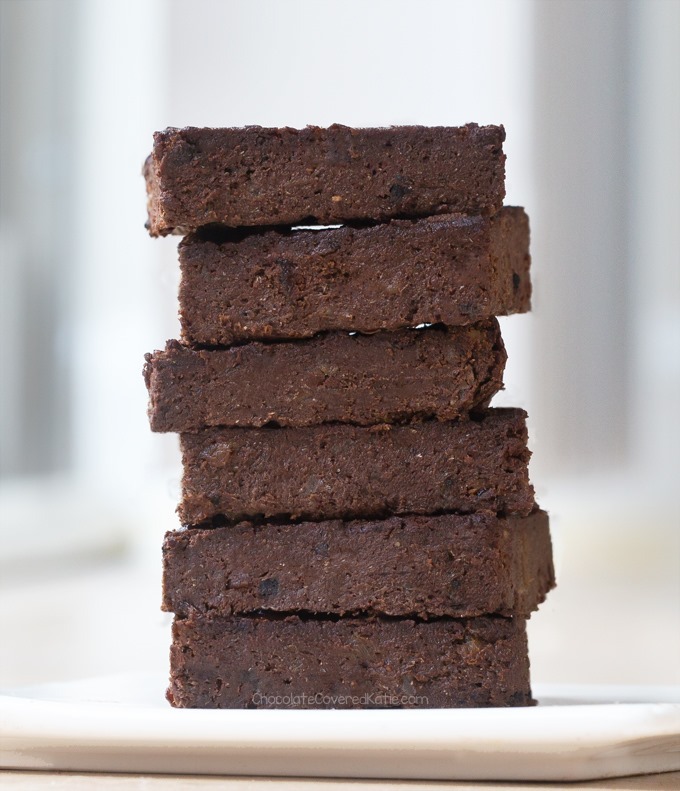 Super fudgy, homemade mint chocolate brownies – that are secretly good for you! 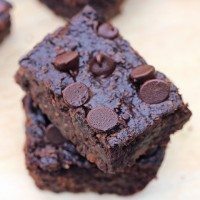 In less than two weeks since I first posted the recipe for the original Chocolate Workout Brownies, it is absolutely CRAZY how many of you have already tried them!!! Already over a hundred of you have emailed me, commented, or posted on social media that you’ve tried the recipe. Seriously, you guys are the best. 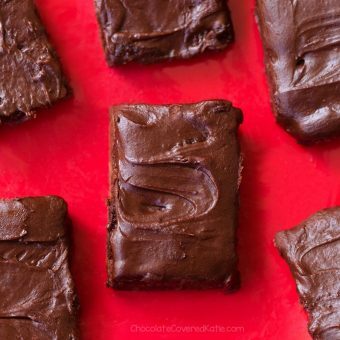 I love these brownies just as much as you all do… and I’m already on my fourth batch. This time I added peppermint extract to the original recipe, because I’ve always thought mint-chocolate is even better than regular chocolate. And these mint brownies are no exception. -Substituting regular cocoa powder for the protein powder works just fine. 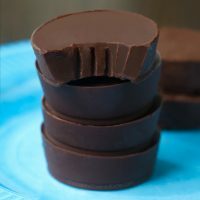 -Adding a tbsp of dutch cocoa to the batter makes them taste even more brownie-like! -For a nut-free option, pumpkin seed butter works really well. Eat them plain or with any of my Healthy Frosting Recipes. My Mint Chocolate Frosting Shots would be particularly amazing here. The brownies can stay out overnight or be refrigerated for a few days. 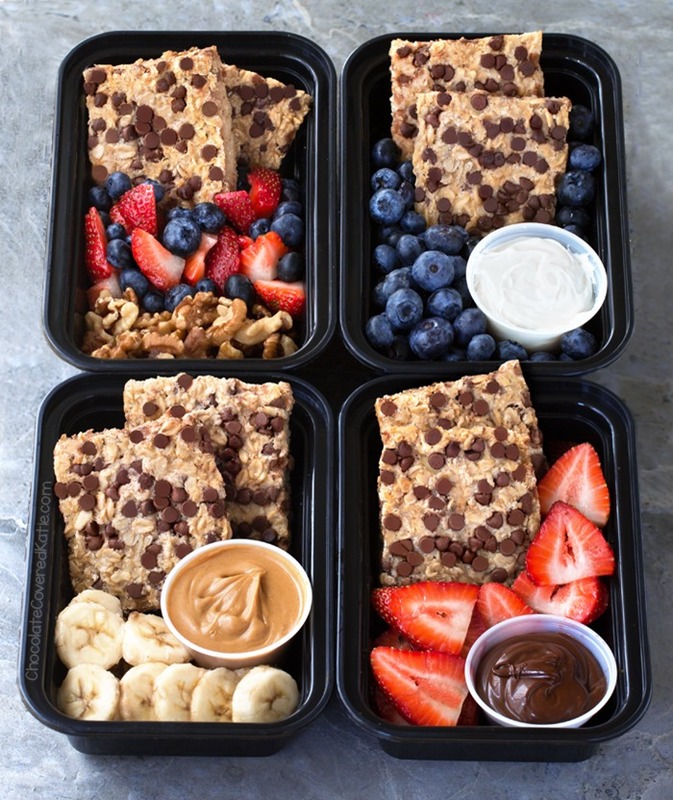 Or you can freeze leftovers to have on hand any time a brownie craving hits! 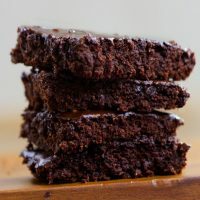 As I mentioned in the original recipe, these brownies are more of a healthy snack as opposed to something you’d make for a bake sale or party. 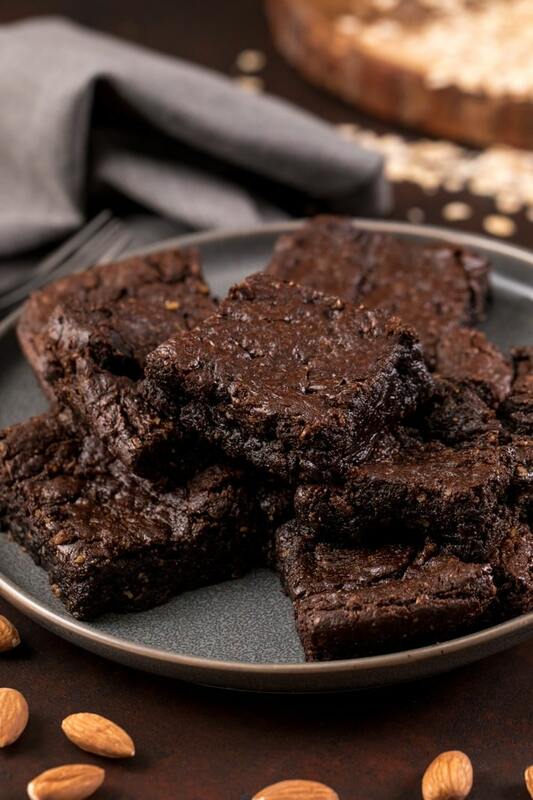 If you’re the type of person who could happily eat an energy bar for dessert instead of a sugary traditional dessert, hopefully you will love these brownies! 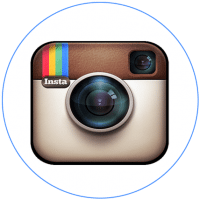 If you do try them, be sure to tag ChocolateCoveredKatie on Instagram, so I can see and like your pictures! *Use the higher amount of peppermint extract—and make sure it says “pure peppermint” on the label—for a more powerful mint flavor. For the most brownie-like taste, I use mostly regular unsweetened cocoa and about 1 1/2 tbsp dutch to make up the 1/3 cup total cocoa powder. Especially if using the applesauce version or if using all cocoa powder (or unsweetened protein powder), I recommend including the sweetener of choice. If using all banana and all cocoa powder, you can add a little sugar or stevia to make up for the sweetness you’d get if you used a sweetened protein powder. Preheat the oven to 325 F. Line an 8-inch pan with parchment paper. 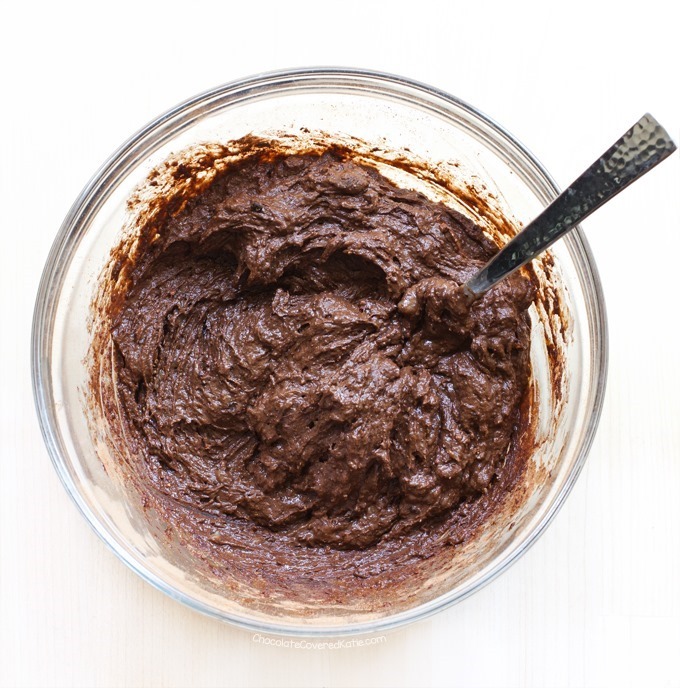 If using natural nut butter, gently warm until it’s easily stir-able. 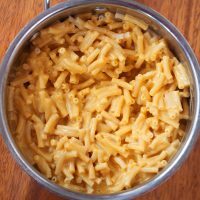 Combine all ingredients in a bowl, stir until completely smooth, and spread into the prepared pan (see video). Bake on the center rack 20-25 minutes (20 for super fudgy brownies) – they will be undercooked when you take them out. Let cool, then loosely cover with a paper towel and place in the fridge overnight, during which time they firm up without losing their fudginess. The brownies are also much sweeter the next day! If you want to frost them, frosting options are listed earlier in the post – you’ll need about 1/2 cup. Store leftovers in the fridge, or freeze for up to a month. Oh wow, mint chocolate is my favorite pairing! (even before pb and chocolate..can you believe it?!). 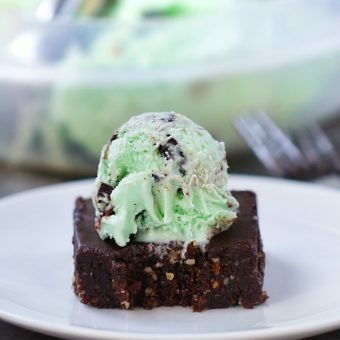 These brownies would be so delicious topped with mint ice cream. Never enough! Hi Katie! These look great. Would you mind if someone made one of your recipes in a youtube video? Of course, I would put the link in the description, and I wouldn’t act as if it is my recipe. If I DID do that, with your permission, I would love to do the cauliflower pizza crust! Its alright if the answer is no. Oh yum! 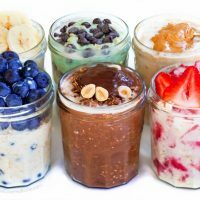 Totally making these for my post workout treat this week! Wow. These are fantastic. I am so glad I had everything in the house, so I could make them right away. Delicious. 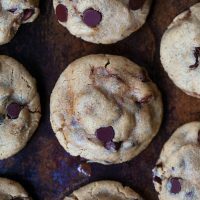 Do you think I could use coconut butter instead of nut butter? Hmmm sounds like a fun experiment. Be sure to report back if you try! Wow, this definitely looks like one of the easiest recipes on the blog! LOVE brownies any day! 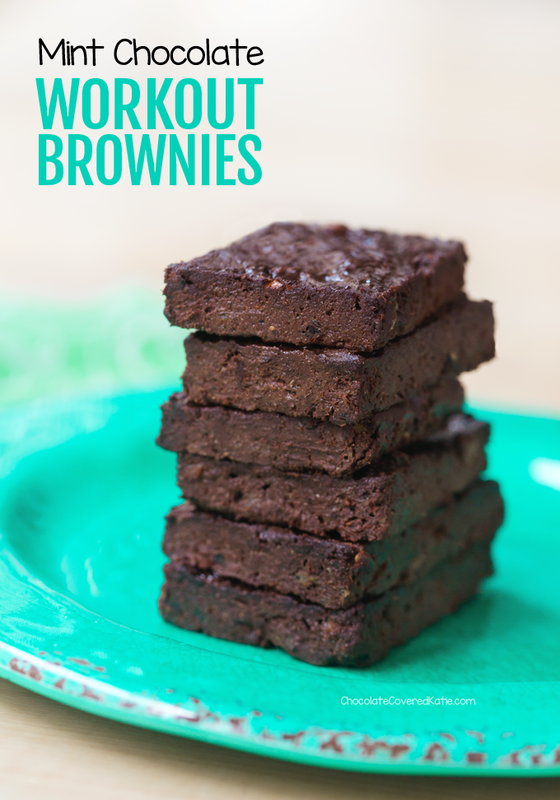 After you posted this mint version of the workout brownie recipe with possible substitutions and changes, I made them. They were EXCELLENT, very fudgy, dense, with nicely deep, dark chocolate flavor, pleasantly but not excessively sweet. 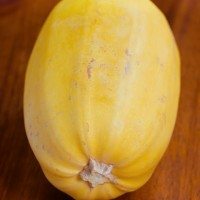 My changes (I cook like you do–pretty experimental, just ONE reason why I love your blog so much. “What?! Follow a recipe?! 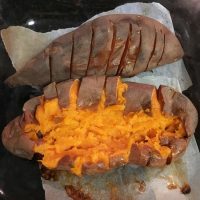 Ah, shucks–personalize it…”) : I used mostly cocoa powder combined with carob powder, as I only had a generous tablespoon or so of protein powder; mixed (~2/3 cup) sesame MEAL with about 1-2 Tbl. peanut butter POWDER, instead of the 2/3 cup nut BUTTER; combined frozen banana & unsweetened applesauce; used only 3 Tbl. dark brown sugar; added 1 tsp. instant coffee powder. Awesome! 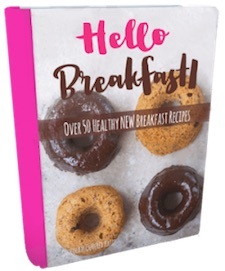 However, I would agree these (probably) would not be received very well by the typical consumer unless topped with frosting–I’ve had WAY too much experience sharing my sneakily healthy recipes with crowds who aren’t accustomed to “eating healthy”…no matter HOW rich and sweet the recipe seemed to us (having eaten a low-sugar, mainly unprocessed-food diet for a few decades now…). 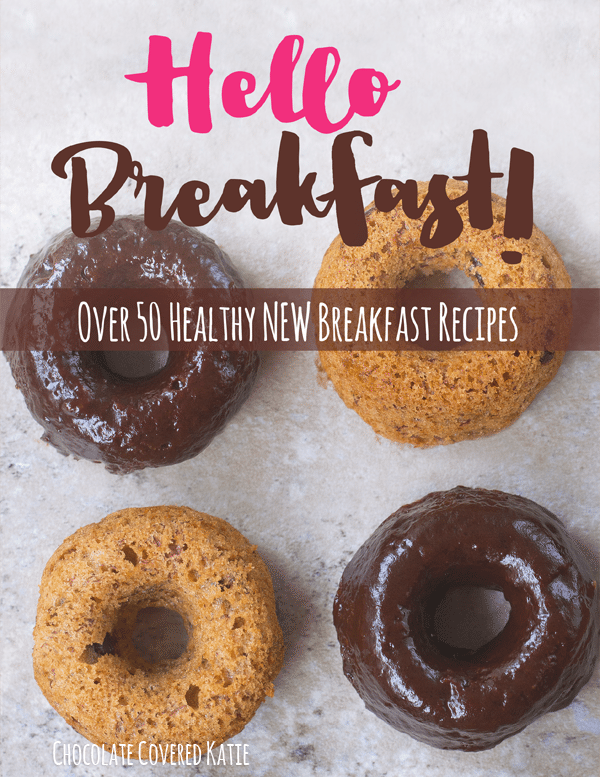 Thank you for your consistently delicious recipes–I love their versatility! 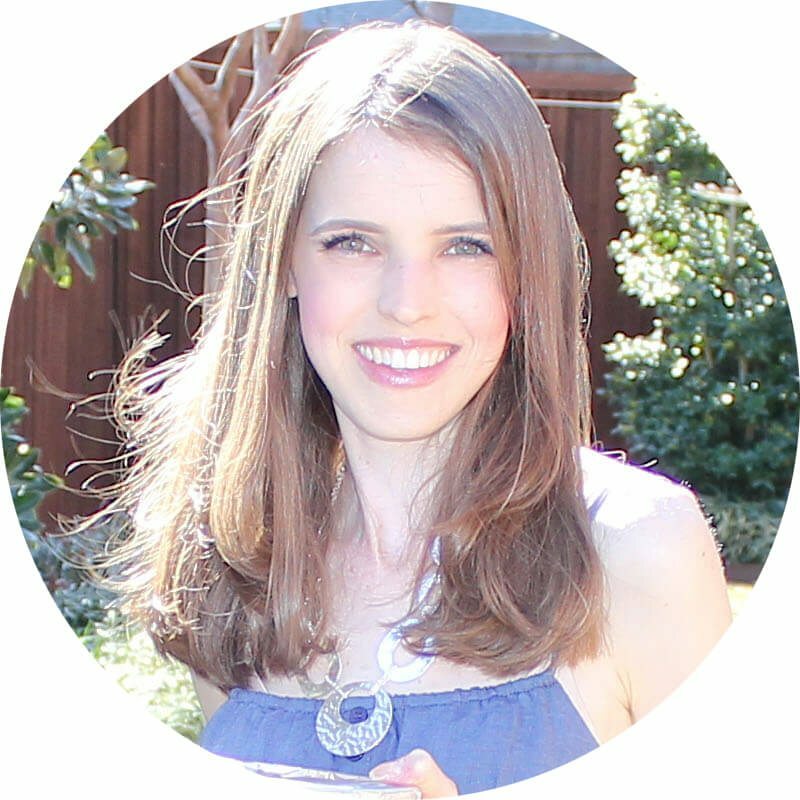 I have referred so many people to your blog who have a wide by of dietary goals. 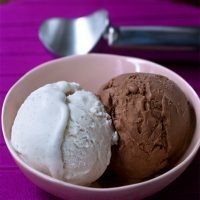 Refreshing dish for chocolate lovers! I also loved the way you have explained each and everything. Wow – what a find! 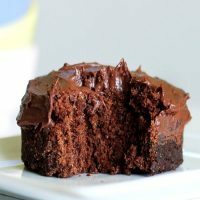 I started doing an elimination diet and found this recipe out of dire need to eat something sweet. 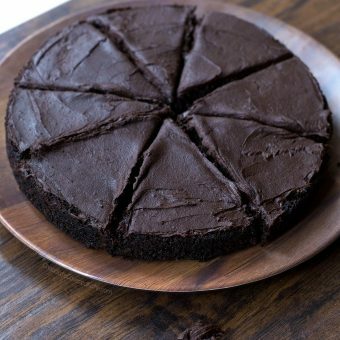 I kept the recipe as simple as possible – used only cocoa powder, almond butter, applesauce, vanilla, chopped walnuts and brown rice syrup as the sweetener (did not add peppermint). All ingredients are within the elimination diet boundaries. 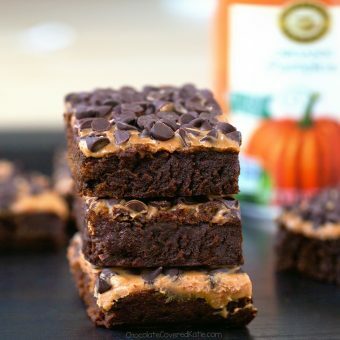 And frankly, I think they taste better than regular brownies; you can eat them without feeling heavy and on your way to having a sugar rush. Thank you for sharing!! I made these and they are to die for! I have been following your blog since I got on Pinterest like a million years ago, or so it feels like! I love so many things that you make on here, keep it up and thank you!! nice recipe, I like the mint in this, thank you!